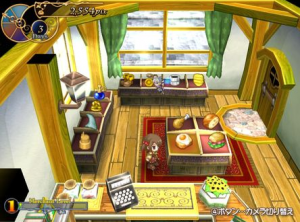 For this post, I review the animated action game, “Recettear: An Item Shop’s Tale”. It has overwhelmingly positive reviews, and is normally priced at $19.99 on Steam–a price that I think is fair, but worth waiting for a sale. 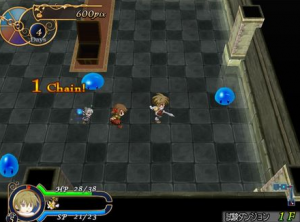 Recettear is an animated action game where you delve through dungeons, and then sell your loot in your very own item store! The title of the game, Recettear, is a combination of its two main characters: Recette, a short girl who has been living by herself since her Papa left on a quest, and Tear, a fairy who works for a credit company that has alarmed Recette with her father’s substantial debt. 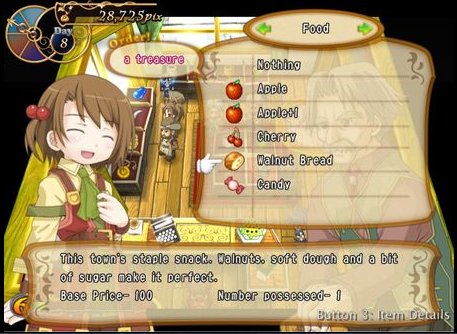 In order to pay off the debt, Tear tasks Recette with using her father’s house as an item store to serve the various townfolk. Your task is to earn enough profit to make the substantial payments to pay the debt off in only five weeks. Meanwhile, adventurers are drawn to the town to search for loot in the nearby dungeons. Girl and fairy recruit and accompany these adventurers, whom you control, as they fight their way through randomized levels and decide which loot is worth carrying out of the dungeon. You will need to choose between items that are profitable, which can be combined into better items, and items that will improve the adventurer’s combat skill and/or survival. In this game, you will spend most of your time doing four things: shopping for items to buy, opening your shop to sell items, adventuring in the dungeon to earn free items, and encountering the occasional story bit. You can buy items at the market or guild hall at a wholesaler’s price, so that you’ll usually profit when you then sell the items, but timing is important as some kinds of items, such as weapons or candy, can go temporarily up or down in price due to special events. You can also redecorate your store with different walls or counters, vending machines, and other objects that will affect what your customers will desire when they stop by to shop. You’ll place items for sale onto a limited number of sales counters in your store, with the ones by the window always attracting more customer attention than the others. When you open your shop, a group of customers files in, provoking a series of sales encounters. Each sale (or purchase, or placement of a order for future pickup) is a haggle, so you must judge how much to charge each customer. Succeeding in strings of successful sales encounters increases your Merchant Level, which grants you various special abilities in the game, such as moving your sales counters or carrying more items out of the dungeon. The adventuring bit is straightforward: Choose an adventurer to recruit, consider items to bring along to assist said character, then choose a five-level dungeon portion to begin your excursion. Every fifth level is a boss fight, after which you can leave the dungeon with your items, or possibly venture deeper into the next set of five levels. These levels are of the “magic dungeon” variety, with randomized dungeon layouts, monster placement, treasure, plenty of traps, and other encounters. Dungeons carry plenty of randomness and risk, and you’re going in solo, so leveling the adventurer and getting good at attacking and evading enemies is required. 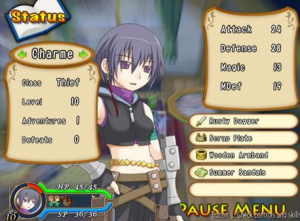 These dungeon trips can take from ten minutes to perhaps an hour, so Recettear is a good game to play in short periods of time, and you can restore to the last save if you fail to acquire much of value or get knocked out. You only have a week to make each payment, and you need time to buy items, to adventure, and to open your shop, so you’ll want to restore to previous saves occasionally. 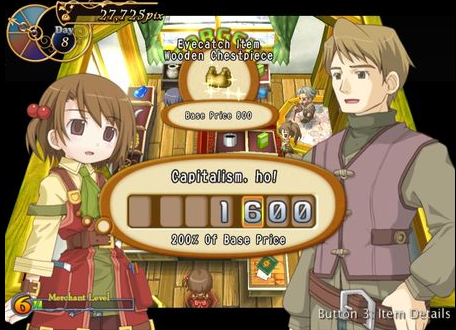 Despite the cutesy anime, the payment goals are a little tough and the combat will challenge you at times, so you’ll feel the pressure as the deadline gets close; oftentimes a fortunate sale of a valuable item will help you succeed (but you’ll wish you could have given it to that one character…). Games by Carpe Fulgur are usually cutesy and simple, but tend to get as difficult as Dark Souls (or an old-school Nintendo action game) toward the end. Recettear is not as difficult as their other titles; although you will be challenged at times, the game isn’t as frustratingly difficult. Audience Note: This game is okay for virtually any audience. Except for references to drinking, there isn’t hardly anything that could be construed as offensive or gory. It can be challenging for ten-year-olds, but saving into a different save slot will allow the player to go back in time and make better decisions. Accessibility Note: I completed the game with a wireless keyboard, even though it is probably ideal for a keypad. Launching the game allows you to choose a configuration menu where you can assign buttons before you begin. One Last Thing: Once you beat the game, you can continue on in an “Endless Mode” as long as you wish. There are also multiple Survival Modes where you play a harder version of the game, just trying to keep the shop open as long as you can before the eventual debt forecloses on you!